The Swedish Central Association for the Promotion of Athletics, abbreviated as SCIF in Swedish, was founded on May 7th 1897 in the Royal Palace in Stockholm. Still today the association enjoys royal protection. The initiative to found the association was taken by Viktor Balck, “the father of Swedish competitive sports”. The aim of the association was to support in various ways the growing sports movement in Sweden. The creation of SCIF gave the country its first powerful national organization for sports. With its independent status, the Central Association took a series of initiatives right from the beginning to promote sports. Starting in 1901, it arranged “The Nordic Games”, winter games, which were held for the last time in 1926 and are regarded as a predecessor of the Winter Olympics. The association also gave economic support for the construction of a large number of sports grounds and has also financed sports museums and exhibitions. It was also thanks to SCIF that Sweden was selected to host the fifth Olympics in 1912. The Central Association was not only responsible for the application to host the event and for the organization of the competitions, but also built the Olympic Stadium in Stockholm. “The Sunshine Olympics” were of crucial significance for the development of the Olympic movement. A real treasure that SCIF owns and maintains is the Tennis Pavilion, which is a listed historic monument. Built in 1896, it is one of the oldest indoor tennis arenas in the world still in use. The B-hall used for tennis at the Östermalm sports ground is also owned by the association. The revenue from these facilities, together with far-sighted donations in the early days of the association, have created a stable financial foundation for the generous support that SCIF provides to sporting activities. The association has its headquarters at the top of the Clock Tower at the Olympic Stadium. The day-to-day work of SCIF is led by an Administrative Committee and subcommittees responsible for different areas. The board meets twice a year. The Prince’s Plaque was instituted in 1947 in memory of the recently deceased Prince Gustaf Adolf, who was chairman of the association when he died. Since 1948 the plaque has been awarded to people who have made prominent contributions to leadership in the field of sports. Sports Federation of the Year is a prize instituted in 1967 and awarded to the club that the SCIF board deems to have deserved the prize during the year. Besides a sum of money, the winning club receives a diploma. SCIF’s Grand Prize for Sports Science was established in 2000. Each year an experienced researcher is rewarded for the publication of research closely related to physical activity and sport. SCIF’s Little Prize for Sports Science was instituted in 2001 and is intended for junior researchers. Two researchers are rewarded each year. 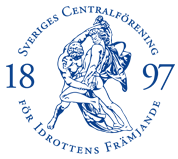 The Central Association supports the sporting heritage, for example through financial contributions to the many sports museums and societies active in Sweden.